Am I too old to have a go? So who should be the new Scotland manager? So with Alex McLeish leaving the Scotland job who should take over? The experts are all coming up with their lists and the bookies have their odds. The front runners would appear to be Garry McAllister, Billy Davies, Tommy Burns and John Collins. McAllister was a great player, but what management experience does he have? Collins has done well as Hib's but how long would he stay in the Scotland job before going back to club football? Davies...hmm can he cut it at this level + how long before he'd get an offer that "he could not refuse?" That leaves Tommy Burns, who has past experience with the Scotland set up, or does it? What about Kenny Dalglish with Joe Jordan and Burns as his key backroom men? Dalglish is unlikely to be tempted back into club football which means stability. Jordan has done well at Portsmouth but if Redknapp get's the England job (which I think he should) then Jordan could be looking for a job. Burns would bring in his experience of the Scotland set up in recent times, and despite his association with the Volts era he did a good job under Smith. So that's who I'd like to see in the job, who do you want? we'll be coming down the road, ....oh just watch the youtube thing and join in! Freddie Flintoff probably Englands most naturally talented cricketer for a generation has got himself into all sorts of problems from his widely reported drinking escapades at the cricket world cup. This in turn has sparked off a debate about whither his losing the vice-captaincy and missing one game was an over reaction to this incident. There were the obligatory phone ins on Radio 5, with many callers saying that the authorities had overreacted. I beg to differ with this view, for it bolsters the view that getting drunk is a socially acceptable thing to do. Yet the UK and Scotland in particular has a growing problem with alcohol. In 2004 there were 8,221 alcohol-related deaths in the UK, almost double the 1991 total of 4,144. That is a staggering rise in just 13 years! If the UK picture is bleak then the Scottish context is even worse. The area I live in, Glasgow, had the highest alcohol-related death rate among both men and women in 1998 - 2004. Fifteen of the 20 UK local areas with the highest male alcohol-related death rates were in Scotland, 14 of the top 20 for women. Two out of three 16 - 24 year old males in Scotland drank more than twice the recommended daily benchmarks [Scottish health survey 1998]. Getting drunk is no laughing matter, especially as for most people this is not an unforeseen consequence of a "good night out", but is the object of the night out as for many the attitude exists that unless you get drunk you cannot have a good time. I hope Freddie is truly sorry, I hope he gets help as his over drinking seems to be a feature of his lifestyle. I hope he does not become crickets George Best. More than this I hope that as a nation we can change our relationship to alcohol. I like cricket - with for a Scot’s man is a bit of an anomaly. I’ve never really played the game although at different times have thought of joining a club and learning. What’s even stranger for being a Scot is that at international level the team I choose to follow is England (or should that properly be England and Wales)? I’ve thus taken an interest in watching the highlights (now there’s an oxymoron) of the Ashes. One thing that has puzzled me is why in general do bowlers make such poor batsmen. I mean you would think that logically they would make the best bowlers. After all they are the guys in the team who when batting should be able to read the wicket, read the approach and delivery of their opposite number and thus be the best at anticipating the type of ball they will face. And yet they to a man seem unable to do this? Why not? Perhaps some of you who have played the beautiful game can explain. Having posted about Scotland's unexpected victory over France at the weekend I guess I can't avoid saying something about our defeat to the Ukraine, after all you've got to take the bad with the good. In some respects it looked like we played better than on Saturday. The first Ukraine goal had been coming for a while and despite it being a scrappy goal they were good for their lead. Kenny Miller however had a couple of opportunities to score for Scotland. The sending off of Elvis and the penalty kid were both poor decisions by the ref. I think Walter Smith has a point when he said the ref's seem to be hard on the British teams. 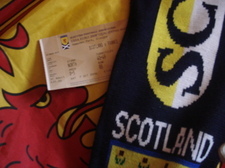 The next international game of importance to us is 24th March 2007 at Hampden against Georgia. My birthday is in March......I wonder if i could persuade Alison to get me a ticket as a present? Scotland 1 France 0. What a result and I was there! Sure it was not pretty, but the second half performance was plucky, with Fletcher and Daily probably our two best players. The bringing on of Teal for McCulloch was a great move if a little late. While France may have had the ball in the back of the net twice in the first half, both were off side, Gordon in goal had little to do. Oh yes there was the shot that hit the post and then the back of his head, but hey that's football. Hopefully the boys will get their feet back on the ground for the difficult game on Wednesday against Ukraine. It feels good to be Scottish today. The sun is in the sky and Andy Murray is doing rather well. oh i also hear there was the small matter of a football match last night in which a new manager and his team also did rather well. Jinky Johnstone who played for Celtic Football club and was one of the Lisbon Lions died today aged 61. I've been out all day and no where near a computer. This morning was spent in the West End of Glasgow at a student leaders meeting. I'm always struck how the West End has such a different feel to it from the rest of the city. The afternoon was taken up with some family time given it's half term. In order to be balanced in taking the good with the disappointing I thought I'd better post this picture. Those in the know say that Murry could be banned for a year which seems hard given his kicking out did not seem malicious and that he's generally known as a "clean" player.